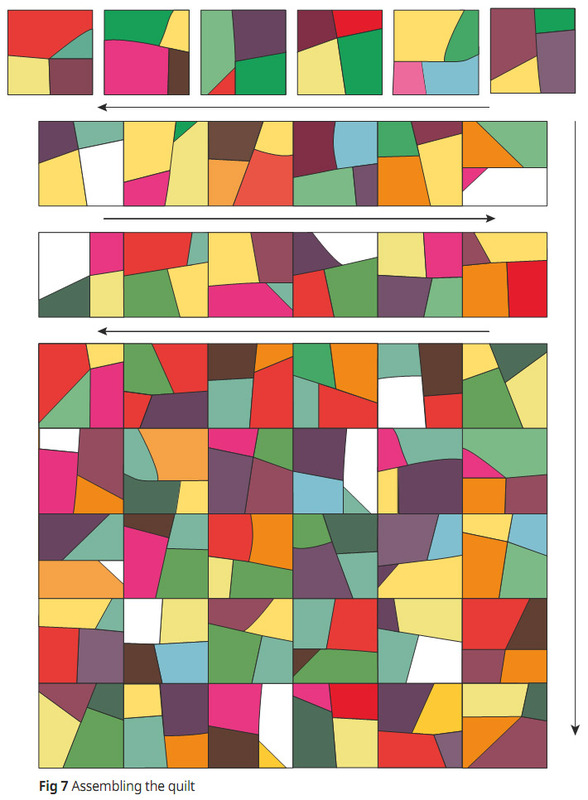 Crazy Patchwork Quilt Instructions.Tutorial ~ DIY Tutorial Ideas! 1. From each of the sixteen solid fabrics, cut one strip 10in x width of fabric. Sub-cut each strip into four 10in squares, for a total of sixty-four squares. Note that you will have quilt blocks left over at the end – cutting extra squares at this stage will ensure that you have sufficient variety for the quilt. 2. From the binding fabric cut six strips each 2 1/2in x width of fabric. 1. With right sides up, stack four 10in squares of different value and colour. Make sixteen stacks like this. 2. Place a stack on the cutting mat, aligning the edges and corners of the squares. 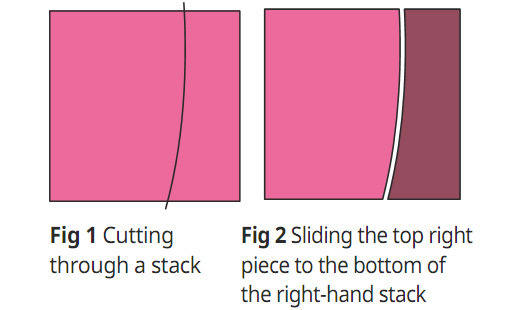 Slice through the entire stack on a slant (Fig 1). 3. Slide the top right piece to the bottom of the right-hand stack (Fig 2). The squares are now in sewing order. 4. 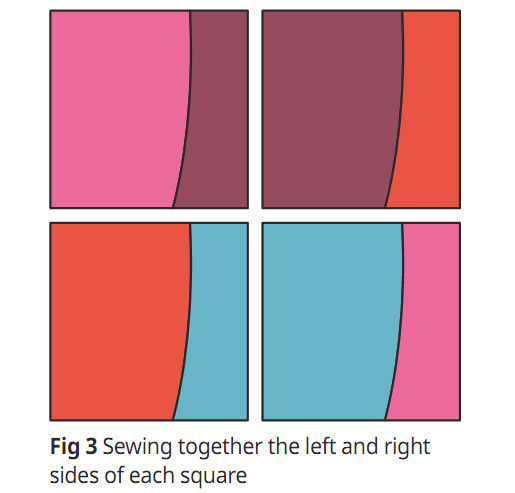 Sew together the left and right sides of each square (Fig 3). Press seams open. 5. Repeat Steps 2–4 with the remaining stacks. 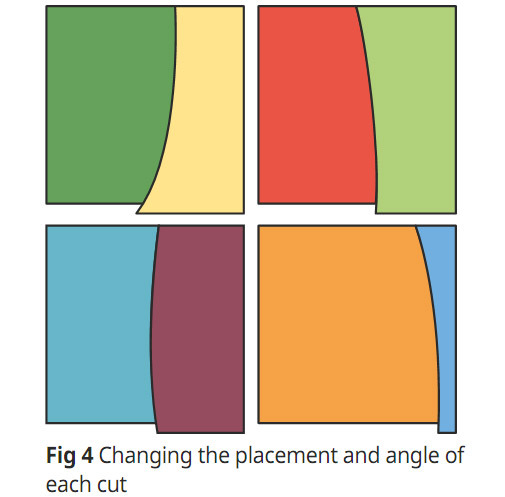 Change the placement and angle of each cut so pieced squares look a little different to each other (Fig 4). 6. Re-group three or more pieced blocks, each from different stacks. Re-stack the blocks right side up with the seam of the pieced patches running in the same direction on all blocks. Make as many stacks as desired. 7. 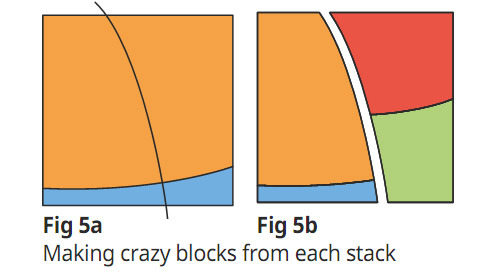 Repeat Steps 2–5 to make crazy blocks from each stack (Fig 5). It is best to finish making all the blocks and then measure all of them before trimming them. Trim to the size of the smallest block or add strips to blocks if a few are too small. 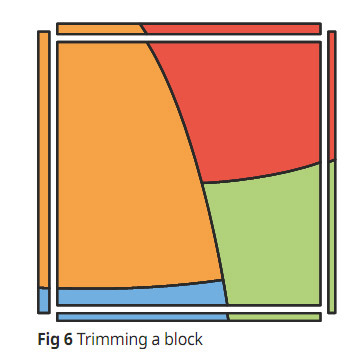 In the quilt shown, each block was trimmed to 8 1/2in square (Fig 6). 1. Arrange forty-eight blocks on a design wall or on the floor, in eight horizontal rows, each containing six blocks. Shufle the blocks around until you are satis? ed with the layout. 2. Sew the blocks into rows. Press the block seams in alternating directions from row to row. Now sew the rows together (Fig 7). Press all the row seams in the same direction. 2. Quilt as desired. 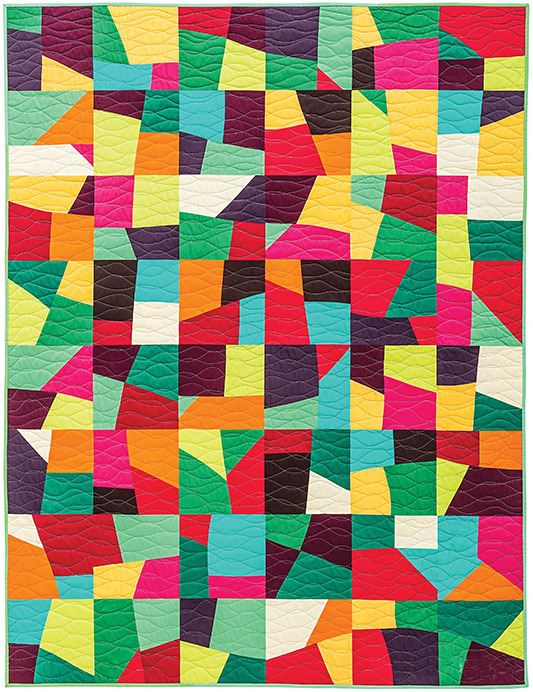 The quilt shown has been machine quilted, with wavy quilting lines, vertically and horizontally. 4. For the binding, join the strips together with 45-degree seams, pressing seams open and then trimming the ‘ears’. Fold the binding in half lengthwise, wrong sides together, and press. Working from the right side and starting part-way down one edge, match the raw edges of the binding to the raw edges of the quilt and sew in place, folding a mitre at each corner. Before completing your stitching, neaten the short raw end of the starting piece andinsert the ending piece into it. Fold the binding over to the back of the quilt and neatly slipstitch in place by hand. Add a label, including at least your name, locationand the date the quilt was made.